From a very new TV favorite of mine to the eternal #1: Nigella. 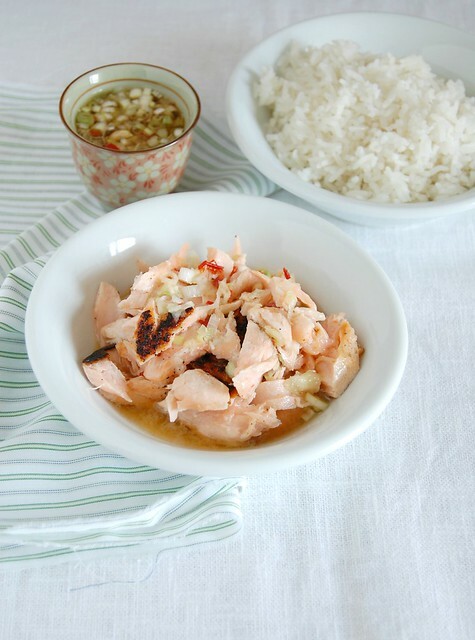 This salmon is so quick to prepare and tastes so amazing that I am sure you’ll get addicted to it as I have. Make the rice way before starting with the salmon because it will take you less than 10 minutes to take it from the fridge to the table. Make the sauce: place the garlic, chilies, ginger, spring onion, fish sauce, sake, mirin, lime juice and water in a bowl and mix to combine. Set aside. Sear the salmon on a flat griddle or frying pan over medium heat for 4-5 minutes on one side and 1-2 minutes on the other. The salmon should be opaque and cooked in the center. Remove from heat and transfer the fish to a plate. Flake the fish slightly and drizzle with some of the sauce. Serve at once, with the remaining sauce on the side. that show sounds great and so does this salmon!! Although I'm not a salmon fan this does look great! !